Little Brother is looking for an instant seal-of-approval that'll place the group among the legends of hip-hop, but do they deserve it?" There was a Golden Age of hip-hop. It's taken me until now to admit this. I didn't want to believe in its existence, even though I witnessed it. Perhaps it's always more fun to think that the time is now, that today is more exciting than yesterday. But sometimes it just isn't so. Anyone who lived with hip-hop in the late '80s and early '90s has to admit that it was a more exciting time overall, one where you didn't have to throw a rock too far into the record store's "Rap" section to hit an exciting record by an MC with his or her own personality and vision. A VHS tape of any of the Fab 5 Freddy-hosted episodes of Yo! MTV Raps placed next to any modern-day video show or label video compilation (major or indie) should bear this out. I used to call the Golden Age talk nostalgia, now I know it as truth. And it's taken groups like Little Brother to help me figure it out. North Carolina-based trio Little Brother knows about the Golden Age; they were listening then, too. They consider themselves the younger brothers of the hip-hop artists of that time. Their debut album, 2003's The Listening, wore the era's stamp on the surface. 9th Wonder's sparse, mellow, yet soulful style was steeped in the sounds of Pete Rock and late-era A Tribe Called Quest, while MCs Phonte and Pooh dropped rhymes that alluded to, quoted from, and mimicked a whole slew of legendary voices from the past: the Jungle Brothers, Tribe, Big Daddy Kane, Nice & Smooth, Kool G Rap, Rakim, and them. If the album sounded like a belated application for Native Tongues membership, it also sounded real nice, with catchy hooks, witty lines, and a comfortable sound. The Listening was a pleasant love letter to the past that also revealed the group to have its own skills. Those talents are part of why the group quickly drew attention, leading 9th Wonder to a whole host of production jobs (for Jay-Z, Destiny's Child, Murs) and Little Brother to a major-label record label, Atlantic. For their second proper album, their first on Atlantic, Little Brother wisely chose to downplay the past in their sound, without changing things up too wildly. There's far fewer quotes from groups past, and 9th Wonder has given the album a fuller sound, layering it with a broader array of textures, occasionally nearly smothering it with a combination of classic soul samples and sung R&B hooks. The most tangible reference to them following in Golden Age footsteps comes on one of the fresher-sounding tracks: "Still Lives Through", a re-interpretation of Tribe's "God Lives Through", itself a continuation of their "Oh My God". That track's perhaps a sign that Little Brother see themselves as continuing a tradition, but reinventing it, no longer just recycling it. Sublimating their influences and broadening their sound is a mark of personal progress, yet other aspects of the album cut against that step forward, sending them several large steps backwards from their goal of making an instant-classic that'll stand apart from the works of their contemporaries. "The good Lord I prayed to him/ And he said, "Niggas is listening now"/ So I better have something to say to 'em", Phonte rhymes on the album's energetic yet brief opener "Beautiful Morning". And The Minstrel Show does look at first glance to be an album with a purpose. It wears minstrel show imagery, from the trio's toothy grins on the front cover to the way the tracks are linked together as if they were part of a minstrel show. The purpose is to suggest that hip-hop today has become a modern-day minstrel show. That's a daring statement, and hip-hop can certainly use a dose of courage. Yet since there's almost no lyrics on the album explicating the "minstrel show" concept (just a few words against wanna-be thugs on the very last track), that's all it ultimately is: one daring statement, one which becomes almost meaningless when it goes unexplained and unsupported. It's as if Little Brother want to give an album that conceptual feeling of a Three Feet High and Rising or De La Soul Is Dead, yet they don't have the vision or wherewithal to hold to it, or make it into anything more than a hollow framework. Even worse, the skits related to the concept drag the album down, especially when, a few songs into the album, they're slowing things down for a full song-length appearance by Phonte's slick R&B alter ego Percey Miracles ("Cheatin'"), which amounts to a fairly funny but inconsequential parody of an R. Kelly/Ron Isley duet which kills any momentum The Minstrel Show had. Not following through on The Minstrel Show's concept seems to illustrate that Little Brother want to come off as social critics without really making any criticisms. That in itself isn't all that new -- hip-hop history is filled with MCs rapping about how deep their rhymes are, without ever actually getting deep. And as long as the MC had verbal skills on the mic, who cared? 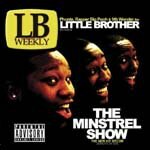 The problem with Phonte and Pooh on much of The Minstrel Show lies with what they replace the hinted-at-but-gone-missing social commentary with. Phonte heard from the Lord that he better have something to say, and as his main topic of conversation he chose... to rant about how people shouldn't criticize Little Brother's music. Starting with the second full track "The Becoming", getting more serious on the next track "Enough" (as in, "seems like whatever I do / it's not enough for you") and continuing on and off through to the album's end, Little Brother's MCs are seriously on the defensive about their music. They respond to specific criticisms of each member, rhyme about how "hated" they are, about how they don't get enough respect. It comes to a head during "Still Lives Through", when Phonte proclaims that people should just listen and not offer opinions: "Why they won't let the music just be what it is/ Is anybody's guess". The defense is a strange place to be for a group that formed in college, signed with a well-regarded indie label, released a widely acclaimed debut album, and are now recording for one of the country's biggest record labels. They're wearing chips on their shoulders as big as boulders, and it's unbecoming, especially for a young group who has already made it to the world stage, not to mention for a group which claims to stand apart from its contemporaries. In this context, it's completely disarming when, a handful of tracks into the album, on the third verse of "Slow It Down", Phonte opens his heart on the record, dissecting his own attitudes with women in a way so frank it's surprising. He starts with the vivid line, "Sometimes I think I'm from another world", and goes on from there. There were moments of raw emotion in parts of The Listening ("Away From Me", especially), and some small ones at the start of this album on "Beautiful Morning", even, but this verse alone takes it to the next level. A few tracks later "All for You" continues that open-hearted approach, with hard-hitting lines about family struggles and how hard it can be to let your feelings show. Both of these cuts exude a visceral emotional sense that strikes a universal chord that listeners will relate to, something their bitterness about "haters" does not. Imagine a whole album that's this raw, this filled with pain and understanding, and The Minstrel Show feels all the more disappointing. The raw emotion in "Slow It Down" and "All for You" demonstrate why so many hip-hop fans feel so passionately about Little Brother, enough so to declare both their albums instant classics. So too does the infectious energy of could-be-hits "Lovin' It" (featuring Joe Scudda) and "Say It Again", and the pure, bare-bones rhyme-for-rhyme style of "Hiding Place", featuring an on-fire Elzhi of Slum Village. The Minstrel Show has these dynamite moments where you see what could have been, where Little Brother display the skills that could truly set them apart from the industry. But as much as they desire to jump-start a hip-hop renaissance, they're too often putting the cart before the horse, acting like everyone should bow down to them as modern-day legends, and for what? The "minstrel show" concept begs for a serious dissection of race and class and power relations within the hip-hop industry, and instead, in the worldview of The Minstrel Show, the biggest inequality seems to be that critics think Phonte's a better MC than Pooh (which he is), or that somebody on the Internet said that 9th Wonder's production can get redundant (which it can). Little Brother act like they're the descendants of the Golden Age, but they're missing a few basic facts about that time in hip-hop. To name just one: None of those now-legendary MCs spent half their second album complaining that their first wasn't more beloved. Thinking about The Minstrel Show gets me to reminiscing about a time when sharper and more cohesive albums than this were a dime a dozen. Perhaps the members of Little Brother need to spend some more time listening, if only to understand the focus and clarity of purpose that the true classics have. For if Little Brother can rein in their desire to make a big statement, unless they have something to say, and structure their albums around their true skills, maybe they really can get to a place where they're doing something so new that everyone will give them the uncritical attention that they apparantly crave.